Due to an unforeseen expense, you exhaust your salary in the middle of the month. Usually, people ask their friends for a small bridge loan to be repaid as soon as the salary is credited in the bank account. But there are times, they may not be able to help. Targeting such individuals, some non-banking financial companies (NBFCs) have started offering small tenure loans that can be rapid in few days and borrower is charged interest only for that small period. Essentially, it’s a credit line on tap for individuals, who can avail a loan whenever they want and repay as soon as they have the funds. These products serve as an alternative to little-known facility that banks offer–overdraft against salary. Though both the facilities serve the same purpose, the one from NBFCs work out to be more convenient but a little expensive when compared to taking an overdraft from bank, as many of them charge simple interest rates. NBFCs can also offer higher amounts compared to most banks. None of them charge any pre-payment penalty. A financial technology (fintech) start-up EarlySalary.com offers short-term loans from a day to a month. It charges an interest rate of two per cent each month. “Once a person takes five minutes to fill in the loan application on the company’s app, the KYC, signing of documents and disbursement can be done within few hours. From second time onwards, it takes few seconds to get the money. A person can avail the loan at one click,” says Akshay Mehrotra, co-founder and chief executive officer (CEO), EarlySalary.com. The first time processing fee is Rs 300. Next time onwards it is Rs 150. The company has disbursed 1,100 loans last month with an average ticket size of Rs 60,000. Similarly, LoanTap offers on-tap credit up to Rs 5 lakh for one day to five years. “The processing fee is two per cent of the loan amount and interest charge is 1.5 per cent each month,” says Satyam Kumar, CEO, Loantap. Once set up, a person can take any amount of loan up to Rs 5 lakh. But it works like credit card. You can repay a minimum amount and revolve the outstanding, paying interest on it. 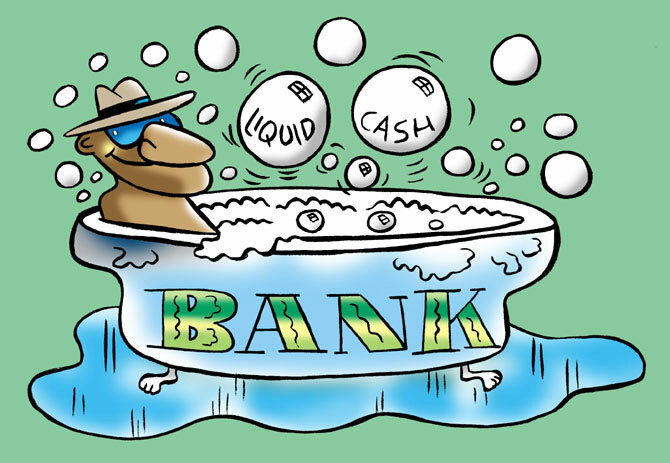 For banks, you may need to visit the branch and set up an overdraft facility paying a processing fee. The facility is valid for a particular period — one year in most cases — and needs to be renewed thereafter. HDFC charges an interest rate of 14-16 per cent. State Bank of India, too, has similar charges. Interest rates on Citibank’s Suvidha Salary Account is about 16-19 per cent. Most public sector banks offer 90 per cent of one month’s salary, up to Rs 1 lakh, as overdraft. Private banks like HDFC offers three times the salary and Citibank up Rs 500,000. While these facilities are convenient borrowers should use them only in case of emergency and not on their usual expenditure warn financial planners. “Most financial disasters happen due to individual’s inability to control his spending. It’s difficult not to get habituated to debt when once uses such a product,” says Amar Pandit, a certified financial planner. “If someone avails this facility more than once, it means there’s a cash flow mismatch. One should take steps to rectify this or it will lead to a debt trap,” says Gaurav Mashruwala, a certified financial planner.